Digression – does anyone else remember the ads? “On the North Side of Boston (says the voiceover) Wednesday is Prince Spaghetti Day” (Woman’s voice) “Aaanthonyyyy….” – shot of child running home to his spaghetti… I’m showing my age, aren’t I? Anyhow… That kind of planning never worked for me. I don’t want to have chicken every Monday (or spaghetti every Wednesday…) I’d write up a nice plan and have a schedule change. And, now – I don’t know from one minute to the next what I will physically be able to do. 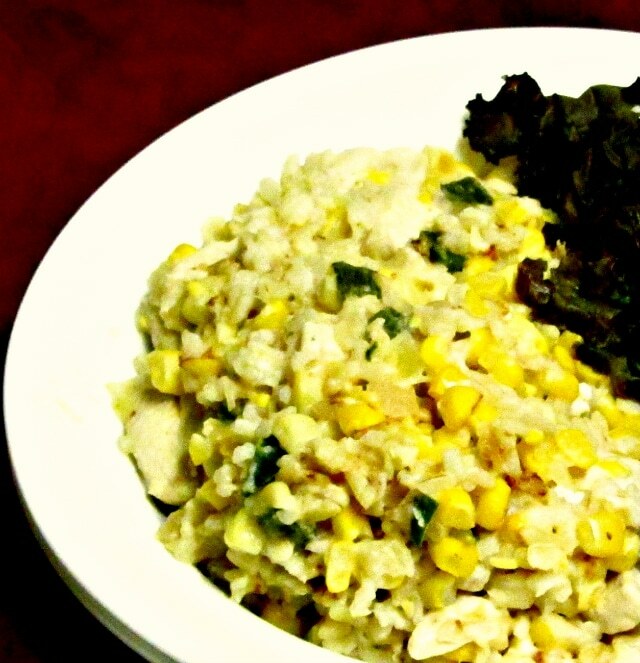 I do plan meals – but I also plan for home cooked meals. I plan to always have the components of a meal available, but I then may assemble those components in different ways at the last minute. I make sure I always have at least some of these components available in a form that I can get to the table quickly. For me, a meal needs some kind of protein, some kind of complex carb, some kind of vegetable (or occasionally – usually at breakfast – fruit.) I make sure I have some of these of these foods – cooked or ready to be cooked and ready in 15-20 minutes – on hand at all times. 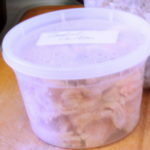 I freeze everything in 1-2 serving containers, so they thaw quickly. I have single serving pieces of various meats or other protein foods – I will talk more about them later. I make a whole pot of brown rice at a time, so I always have containers of it ready (and am lucky to have a rice cooker – I can set it up in the morning and have rice ready when I get home.) And there is always pasta, and quinoa, both of which cook in about 20 minutes or less (including time to bring the water to a boil.) Couscous is even faster. Potatoes or sweet potatoes can be microwaved. 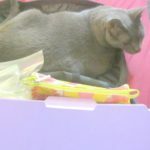 Or there is bread, or rice cakes, or crackers… usually lunch, for me, but available. Any regular reader knows I prefer and use fresh local vegetables most of the time – but it doesn’t have to be complicated. Cabbage, zucchini, and a few others are quick and easy, and I freeze leftover greens, which reheat well. And, you know – I truly do believe that commercial frozen vegetables are one of the greatest inventions of the 20th century… they give us variety all winter, and something quick all year. And canned tomatoes. They’re especially valuable in winter,as a vegetable serving, and they can help tie a meal together. Add some tomatoes and some herbs, and you have a sauce… Or use a dab of tomato paste to add depth of flavor and richness to any dish. 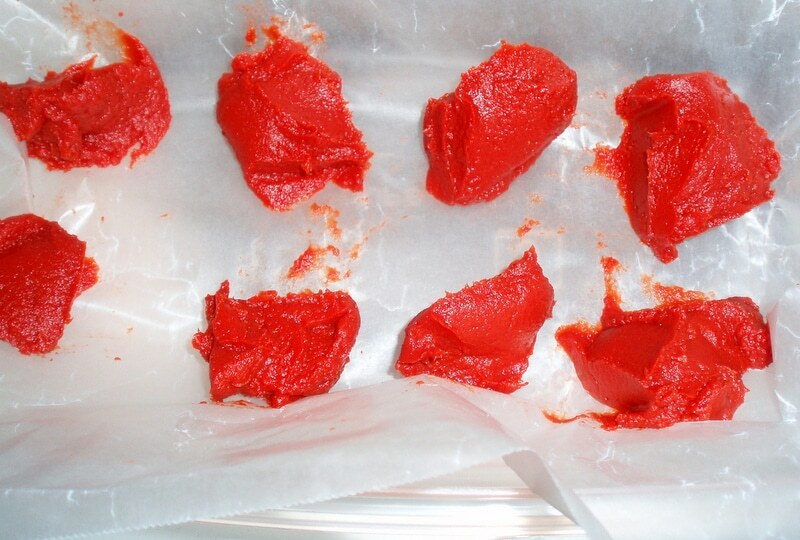 I never used to use tomato paste – I couldn’t usually use a whole can at once. Last year, I started using some and freezing the rest – and this gives you a good example… Sometimes I just use about a third of the can, and put the rest in two small plastic containers I have, each of which holds about a third of a can. But you can also (especially if you don’t have handy little containers) easily freeze individual spoonfuls. 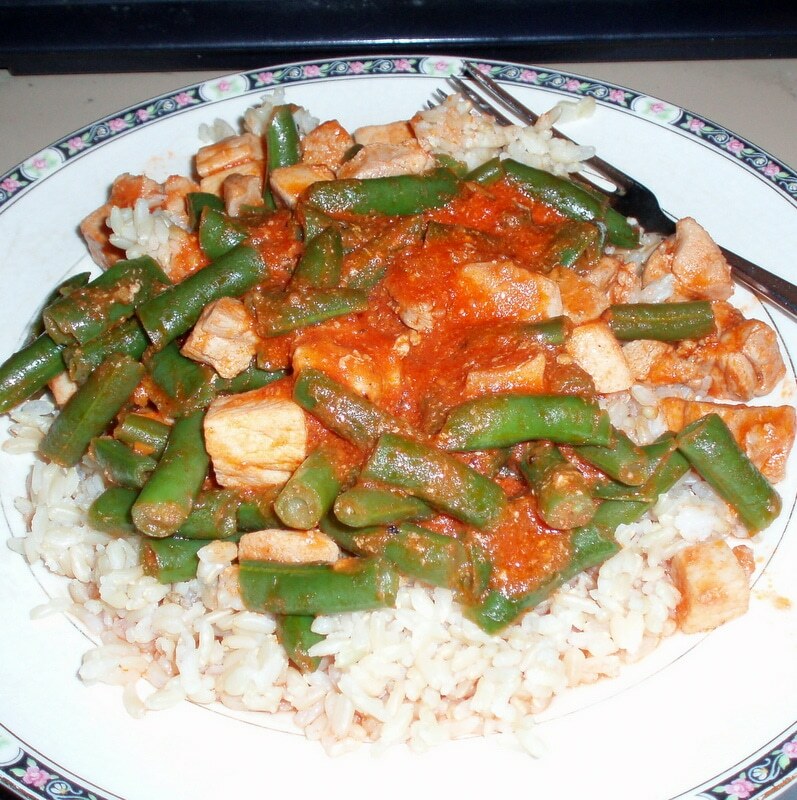 Then – a meal from the freezer… as an example. 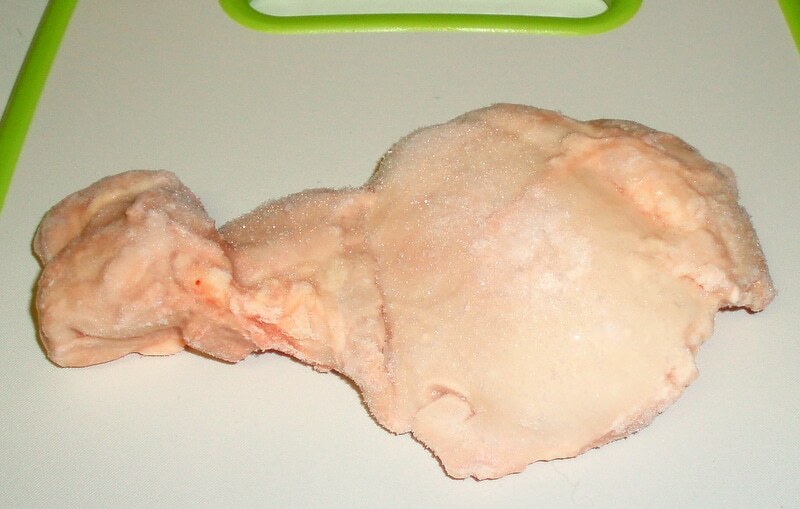 Most grocery stores these days have skinless boneless chicken breasts and/or thighs in the freezer case. They have been flash frozen to stay separated – usually cased in ice to prevent freezer burn. (This does mean you pay chicken prices for the ice… you can also just freeze your own boneless skinless pieces, but use them before too long – freezer burn is a risk. And you need to be careful that they don’t stick together in a massive chicken lump.) I like to have some of these on hand, as a good emergency meal. You can just cook them as they are, on a grill, or braise in a little water. 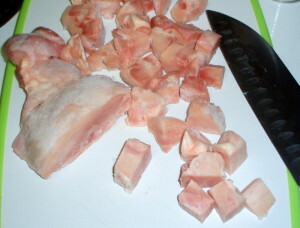 The pieces are often different sizes, though, so I sometimes cut them up – which also helps them cook faster. I find that I can just let them sit on the cutting board for about 5 minutes, and then I can cut them in chunks with a reasonably heavy knife. Looking at the picture, you can see the ice sparkling on the meat – and the sharp edges of the pieces show that it is still frozen. I heated olive oil in a frying pan, then added the chicken. Stirring them around, I very slightly browned some of the meat – then added water. And now I added some of the tomato paste, and a sprinkle of a seasoning mix – I used Mrs, Dash, this time, though I could also have used any herb mixture. 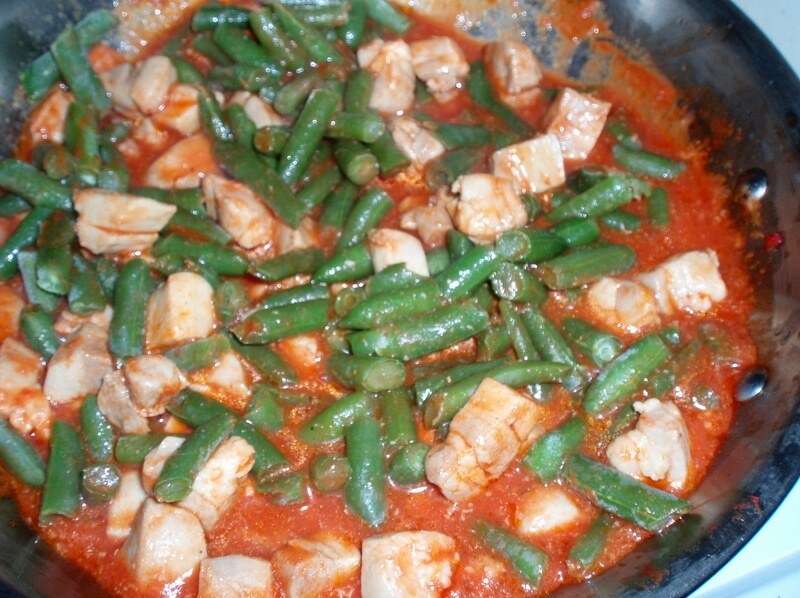 I let the meat simmer in this improvised sauce until it was cooked – then I added frozen cut green beans. Nothing exciting – but handy. Brought it all back to a boil, which cooks the beans enough for our taste – it can be simmered more if you prefer your beans cooked more. Meanwhile, I took a container of rice out of the fridge, put the rice on a plate, microwaved it for 2 minutes, and divided the rice between plates. I served the chicken mix over the rice, and called it dinner. Very simple, and a home cooked meal ready in very short time, including the first brief thaw (while I can change clothes, or set the table, or…) on a day when I need it. Let the chicken thaw on the cutting board for just about 5 minutes. Cut it into bite sized pieces. Add 1/2 c water, seasoning of your choice, and tomato paste. Bring to a boil, lower heat and let simmer 5-10 minutes. Add green beans, Return to a boil, cook until done. I love this Anne, planning for meals is what I do! I can let go of the perfectionist 'menu planning' nag at the back of my mind, and acknowledge like you, some days I don't know whether I will be able to follow through on a planned menu, which rather makes a mockery of elaborate planning! My pantry and fridge and freezer operate as stores though, and I can put a meal together within 20 minutes fairly easily. That's it - I need to be able to wing it. I posted today in WIAW about a meal that I planned to assemble. Then today, though, I had something planned - and a badly timed migraine. I could cook, by dinner time, but was still a bit foggy and tired - so I scrapped the meal I'd planned (we'll have the chicken tomorrow) and again threw together some cooked beans, cooked meat (ham from the freezer, this time) and frozen vegetables. Different assortment of foods, seasoned differently, it wasn't repetitive, and I didn't have to wear myself out to make dinner. If I hadn't even been up to that, Rich could have put them together... though he was in the middle of some work, so I didn't interrupt him.